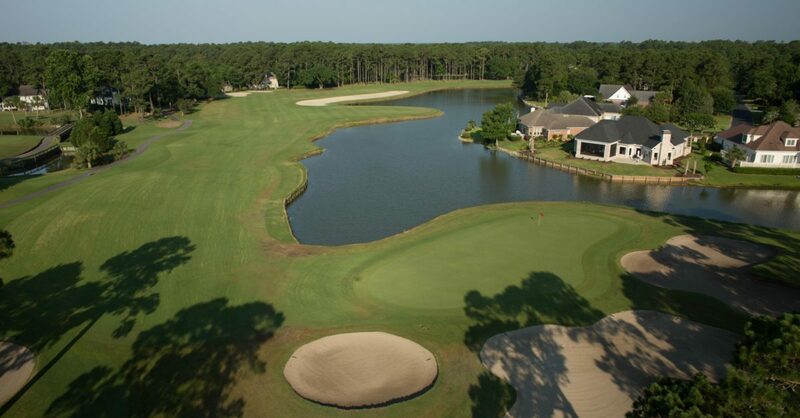 The semi-private River Club Golf Course has proven one of the most challenging courses in the Myrtle Beach golf area and features new Champion Bermuda greens. This Tom Jackson signature course is one of the premier “plantation” courses and a favorite among returning golfers. Located in the affluent Pawley’s Island section of Myrtle Beach, this course offers a unique experience. True to its name, River Club features water on 15 of 18 holes, and over 100 sand traps and bunkers. Long hitters have some room off the tee, but approach shots must be true. The dramatic par-5 18th is unquestionably one of the finest finishing holes of golf courses on the Grand Strand. This hole offers risk and reward to those who can carry the water twice for a possible chance at eagle. Named to “The 100 Greatest Holes along the Grand Strand” (#14 and 18) by The Sun News.